IF GOLF IS YOUR GAME, HEAD FOR PALM SPRINGS. 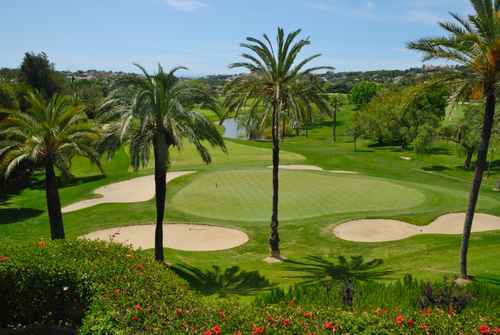 There are 110 world-class golf courses, many of them challenging courses designed by well known professional golfers and golf course designers. If you want to improve your game, you’ll also find great schools and clinics, many of them staffed by professionals, as well as rentals, equipment sales and repairs. Based on rating by Golf.com, the greater Palm Springs area is home to five of the top 30 courses in California, many of them multi-course facilities. Because of the competition between these courses, golfers are the winners with lower playing fees and more amenities. WESTIN MISSION HILLS westinmissionhillsgolf.com One of the choice golf locations has to be the Westin Mission Hills in Rancho Mirage, boasting a course designed by famed course designer Pete Dye and another designed by golf great Gary Player. Listed as one of Golf Digest’s® Top 75 Golf Resorts in North America, The Westin Mission Hills Golf Resort & Spa is truly a golfers dream featuring the two championship Troon-managed golf courses that are available to guests. ✷ And last but certainly not least is the Greg Norman Course at PGA West. Escena Golf Club features a public 18-hole championship golf course by Nicklaus Design that’s been named as one of the Top Ten Public Courses in California by PGATOUR.COM. It’s built on 172 acres that have heavily landscaped native areas and multiple water features – perfect to provide a challenge for golfers of all levels. Whether you choose one of the many high-end resort courses or one of the highly rated public golf courses, you’ll definitely have great views of the towering San Jacinto Mountains that surround the Coachella Valley, beautiful desert landscaping and dramatic waterscapes. This is just a starting point for your perfect golf getaway. The good news? You can’t make a bad choice.